Pirate Latitudes is coming out tomorrow and I will be first in line at my bookstore for my copy. I’m very excited about reading the novel, but I also find myself feeling sad. 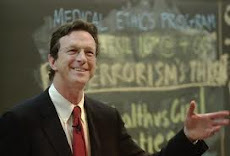 For several years now, when Michael Crichton published a new book, we could look forward to his television appearances to promote it. The day Crichton’s last novel Next was released in 2006, he appeared on Good Morning America, and later on appeared on Book TV and Charlie Rose. This time he won’t be there to tell about his book. I will be thinking of him a great deal tomorrow. The picture that emerges of prominent climate-change scientists from the more than 3,000 documents and emails accessed by hackers and put on the Internet this week is one of professional backbiting and questionable scientific practices. It could undermine the idea that the science of man-made global warming is entirely settled just weeks before a crucial climate-change summit. What has been revealed so far does much to vindicate Crichton’s thoughts on global warming, as stated in the author’s message and appendix of his novel State of Fear and in speeches he has made. Somewhere, I think Michael Crichton is smiling right now.